As I’m writing this, I am wondering how best to describe my mom. Dad was always in charge, but Mom was always there. Mom did everything with us kids. I don’t know how we didn’t drive her crazy. I knew just how to push her to her limits and Lottie always pushed hard to get her way. Ruth was the drama queen who needed attention while Courts was spoiled and wanted his own way. We each could have driven her crazy all by ourselves. While the pages that follow will tell many stories about Mom, I wanted to give you my thoughts about her before you get to them. Mom was always happy. She always seemed to do whatever Dad wanted to do, and she always took care of us kids. She never complained and was, overall, a bright and optimistic person who never seemed to be down. The enthuse-asm and happy outlook that I have been blessed with surely come from her. When I was little, I would try to wake her up early and she would say, “Just give me fifteen more minutes” or “Get the other kids some cereal.” She was always cooking. Every night we had dinner together unless we were at someone else’s house. We hardly ever ate out. She must have felt like all she did was cook, clean and wash. Mom with a brand new Lt.
Tuna fish casserole, chicken and rice or chicken and mashed potatoes were some of my favorite meals and when Dad was gone she would make them for me because he didn’t like them much. Of course, her homemade bread has always been my favorite thing. I could eat it for every meal. We didn’t get sweets often, but I remember having Jell-O Knox Blocks many times; a treat I have not had in years. My favorite dessert was her fluffy cheesecake. More often than not, cakes and cookies were baked for church dinners. Since Dad’s claim to fame was his disciplining methods, I would have to say that Mom’s was her dinners. We had dinner at home every night growing up. It was always a real dinner, too. Not pizza or potpies or something heated in a microwave. Dad liked to have meat and potatoes, so our dinners always included some kind of meat, at least one vegetable and bread. Mom fried everything in bacon grease. She would strain the grease after dinner and it would get hard in a jar, only to be used again the next night. We had fried pork chops and fried potatoes, or rabbit, squirrel or deer, because Dad was always hunting. On Sundays we usually had a roast. Mom would turn the oven on and it would cook while we were at church. We always had a big dinner on Sundays because Dad didn’t want to eat out and keep a restaurant waitress from being able to go to church. We could not have the football game on during dinner, though. It was a special treat when Mom made homemade bread, and we rarely had dessert unless it was someone’s birthday or we were having company over. Each night, Mom would cook all of the food and lay it out on the table. We would all sit down, hold hands and Dad would call on one of us to pray. I didn’t like vegetables so I would load up on potatoes or meat and Dad would remind me to leave some for the other kids. During dinner, Dad would ask us about school or what we’d done that day and we talked about all kinds of things. Somewhere along the way, Dad and I started playing basketball after dinner by wadding up a napkin and trying to throw it in each other’s cup. I always sat at the end of the table opposite Dad and the first one to ten baskets would win. I didn’t beat him very often. When we were growing up, we all griped about the food Mom made, but when I went to college I really started appreciating Mom’s cooking and now I love to visit her and see her laying food on the table just like Grandma Lewis used to do. If you kids ever wonder what Grandma Lewis was like, just look at my mom. They look alike, were always happy and always busy doing something. Now that I’m older, I really see the benefit of having family dinners together. Mom put a lot of work into our dinners and they kept our family close. Those dinners are some of my best childhood memories. On our birthdays, Mom let us pick what we wanted to eat and made a cake in any color we wanted. As an added bonus, we didn’t have to do any chores on that special day. On Mom’s birthday, Dad would take us all out to McDonald’s and Mom would order a fish sandwich. She always loved those McDonald’s fish sandwiches. Can you believe that a special occasion dinner might be enjoyed at McDonald’s? A trip to the store with us four kids had to be a real challenge. Ruth Ann would be in the full cart with all of the food while Courts sat in the seat, and me and Lottie would be fighting about riding on the front while Mom told us to get off because it was too heavy to push. The younger kids would point and ask for the things they wanted while I grabbed my own selections off of the shelves and brought them to Mom to see if she would buy them. I loved getting out of the house and going shopping with her but, looking back, my mom must have hated it. 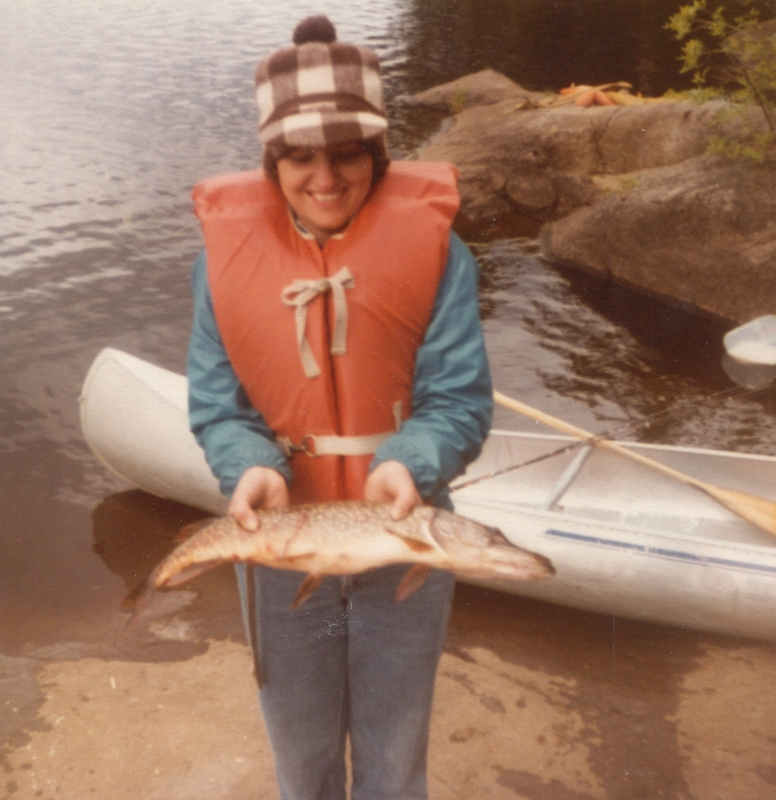 Mom with a BIG catch on her Boundary Waters Trip. An interesting fact about Mom is that she was never bothered by poison ivy. When Grandma Lewis was pregnant with Mom, she and Grandpa were traveling and stopped to use the bathroom. There were no bathrooms, so she went in the woods and evidently picked a spot that was full of poison ivy. She even used a poison ivy leaf to wipe with. Grandma was covered in poison ivy so badly that it made her sick and she had to be on bed rest. Since Mom was inside of her, I guess her blood built up an antibody to fight poison ivy and she never caught it when we were growing up. I have heard that if you drink goat’s milk from goats that eat poison ivy leaves, you will become immune. There must be something to it. While Dad was very strict, Mom was a lot easier to push around. She gave me spankings when I was little but they didn’t hurt so I would only pretend to cry. Mom did have a breaking point and I learned how to push her to the edge of that point and stop, because if I pushed her past that point she would probably tell Dad about my bad behavior, and I didn’t want that. As I grew older, I had to be careful around Mom. Dad was very trusting and would believe almost anything, but Mom was always asking questions. Blame it on women’s intuition, but with Mom you had better have your story straight because she could sniff out a lie even easier than Dad. Mom with her heavy piano that contributed to Dad’s four hernia operations. 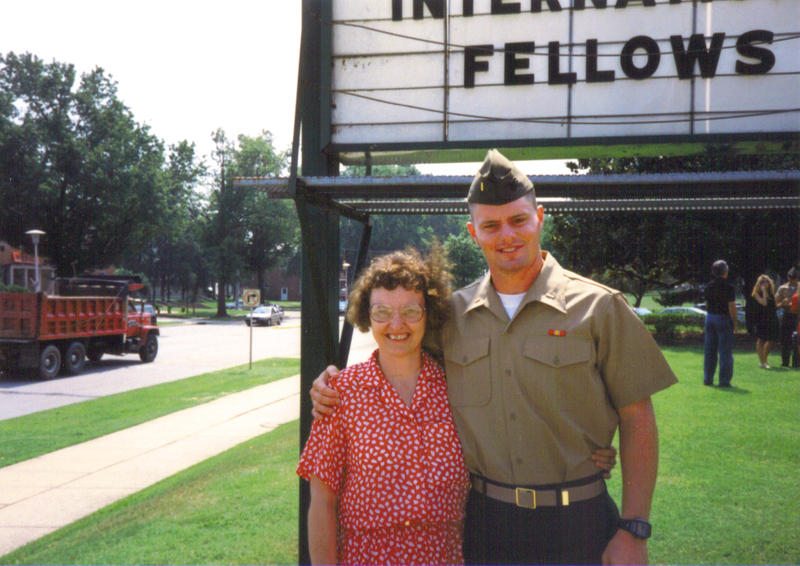 Mom taught kids at all of the churches we attended. 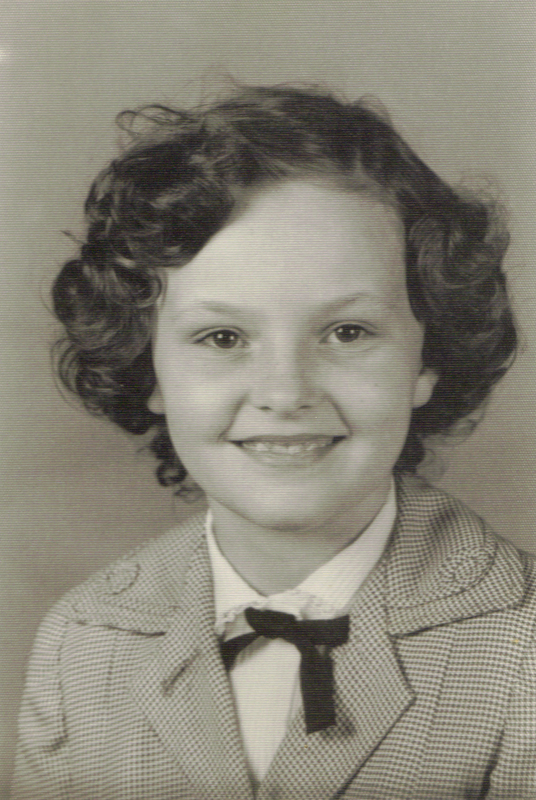 She taught Girls in Action (GA) and always helped in Dad’s church work. She has led many people to the Lord over the years. She and Dad often sang together at church and I wish I had recordings of them singing today. 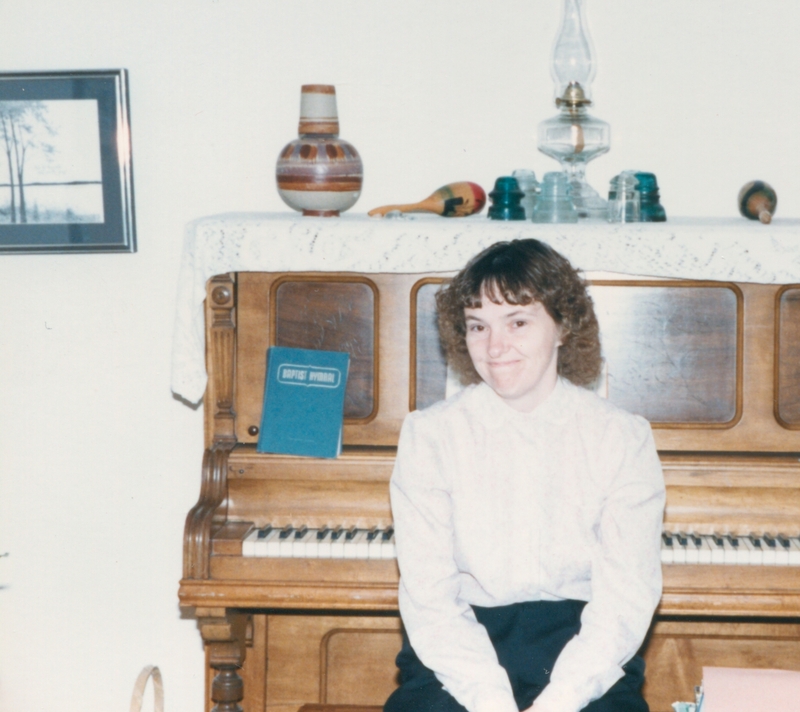 When the church was in need of a piano player, Mom sometimes filled in. Throughout my childhood, my parents kept a big, heavy piano that we moved from house to house whenever we relocated. When they left to become missionaries in Africa, I finally thought I was rid of the piano but Lottie kept it and now I still get to help her husband, Josh, move it from time to time. Like Dad, Mom was the same person in private as in public. Now that I am grown, I understand that finding a person like that is rare. Mom has followed Dad all over the world and al-ways made a happy home for us kids in the process. I am also only beginning to learn how good her advice is. While we joke about her being disorganized, spacey and a procrastinator, Mom is the one who always planned the meals, had the clothes washed and Dad’s picked out and ready for him, had her lessons ready for her church classes and kept so many things going for all of us. Mom and Dad have always been a team, and while Dad was the star who called the plays, Mom was always there, helping run the plays. It took me growing up to realize how much she did and how important she was in making a happy home in which to raise four successful kids. Mom is a Proverbs 31 wife. Whenever I read that chapter, I always think of her. Today, she is the one who makes the scrapbooks, scarves and quilts. She sends us cards and letters when we need them, and most importantly, like Dad, she spends hours praying for us all. I know that without her love, attention and help, I would not have made it as a kid. But I’m even more confident that without her prayers I would never have made it as an adult.